There was some discussion over the option on the window menu which controls the attribute known to the developers as “stick”. This makes the window follow you around when you move workspaces; it’s useful, for example, to keep a clock applet always in the corner. Some people think that the window menu should have two options for this, and some people think that that is a waste of space, and not elegant, and rather it should just have one option which toggles. In that case, however, it’s not very clear how to word it: someone has suggested “Always on current workspace”, but what does it mean when that’s turned off? “Never on current workspace”? “Sometimes on current workspace”? The Human Interface people were helpful here. Speaking of human interfaces, apparently now if you select the High Contrast Inverse theme, Metacity colours certain icons on the window menu a tasteful shade of black on navy. I think we need to get to that soon before Trinny and Susannah track us down. Some people on Launchpad would like to be able to resize by dragging using mouse buttons other than the standard ones, because they don’t have a middle button. And Benjamin submitted a patch for the theme directories problem which (informally) looks good. Unless anything particularly odd shows up in it, it should go into the next release, expected some time early tomorrow morning Greenwich time. 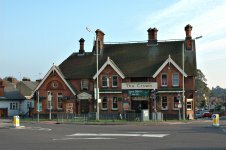 Photo: The Crown, St Albans. Photo by Gary Houston, public domain.